To continue the theme of the previous post about paper lantern centerpieces, Allison Patrick of Aster + Quail sent over this idea for using the very same technique to make Christmas - or anytime - ornaments. Brilliant and so cute. They remind me of artichokes! 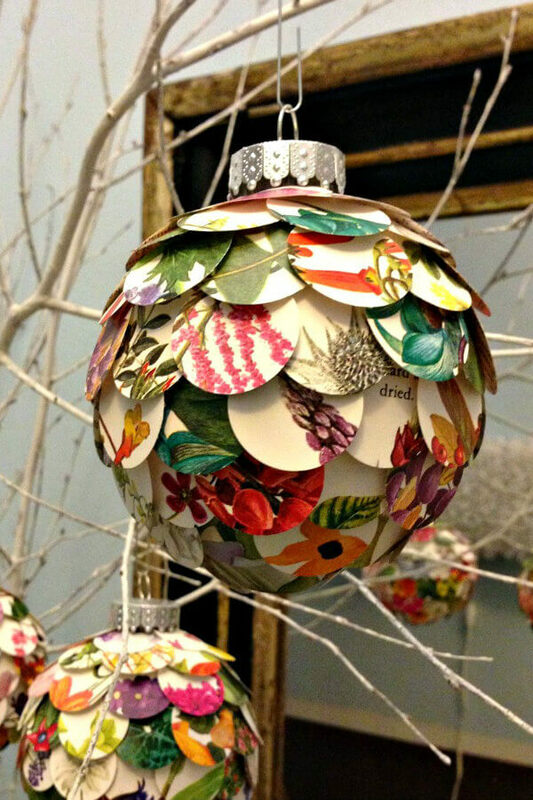 I love the way she's hung some in her apartment entryway on bare branches. I'd leave them up all winter as a sign of spring to come. To make one of your own, Allie suggests first drawing guidelines by eye around a plastic ball ornament with a Sharpie marker. Punch 1-inch circles from a flower painting book as she did, or use any colorful images printed on heavyweight paper. Adhere circles bottom to top using a glue gun. This would be a great project for breathing new life into (onto, rather!) discolored Christmas balls you haven't had the heart to throw away. And it won't be long until gardening catalogs start arriving in the mail, so there's a good resource for pretty flower pictures. Now I'm in the mood to craft! I have a table top tree made of iron. These would be wonderful ornaments for it. I can picture how pretty that would be! Thanks Allie for a fantastic idea ......i am going to give them a go for my twig christmas tree. Beautiful stuff! Love your blog. Always inspires me. Thanks Stephanie - I love your book art! Wow that Allison is clever! Thanks so much for sharing this with us. So beautiful . Thanks for sharing this idea Ann. are you able to show the bottom of the ornament. how do you get started on this? Hi Pya, I don't have a photo of the bottom, but I would either draw a circle with a Sharpie marker as Allison suggests (or eyeball it) and glue a ring of overlapping circles along the marker line as the first layer. I'm guessing just a few would do. Then draw the next ring and so on. Notice she overlaps the circles over and under. Once you have the feel of doing the first one, I'm sure it gets easier. Pya, another thought... glue one circle to the very bottom of the ball and then start adhering the rounds of circles. Oh those balls are so pretty! I just had to Pin this too - that's a keeper! I've also got this linked to my ball ornaments post as well today! Thanks Heather! Your ball ornaments post is a great collection. Would be a great use for all the old Christmas cards I have saved in a box! I wonder if glue dots would work? Glue dots might work if they aren't too thick, otherwise the circles might flare out away from the ornament. How about all the pretty Christmas cards you received?? ?